Naturally, we could find fútbol in Spain. But could we find American Baseball? 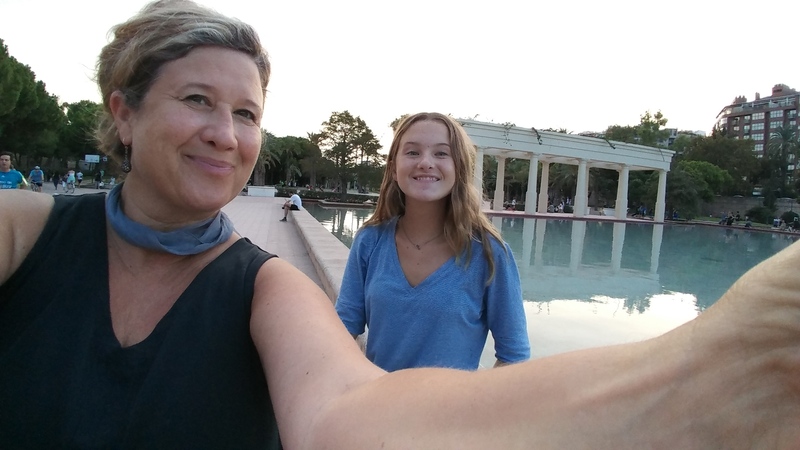 Years ago when we lived in Valencia, Sydney played fútbol (= american soccer) and it was a memorable experience for her… for us all, actually. Playing sports in another country is a great way to make friends and learn the local language on the field, pitch or wherever. 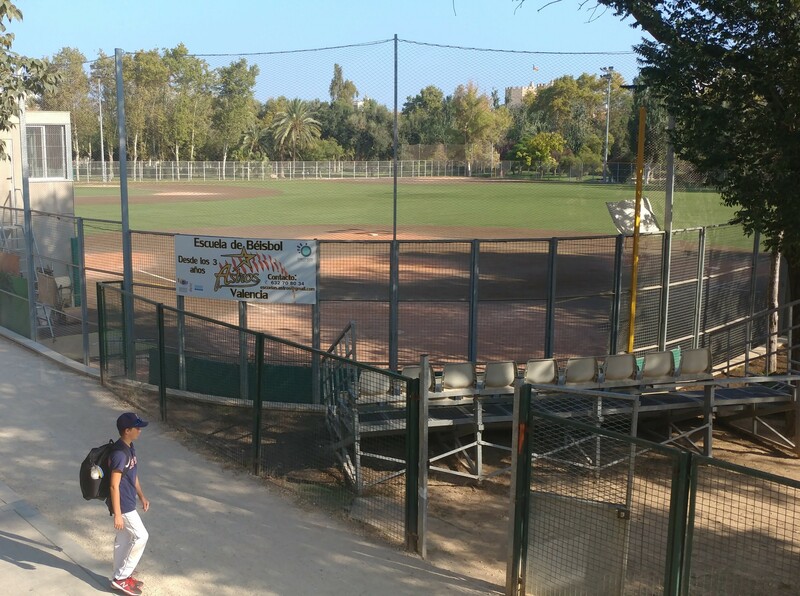 I typed in “Baseball, Valencia, Spain” and expected my computer to laugh at me… Instead, I was shocked to find just what I was hoping for: “Campo de Béisbol” – fields (and teams who play!) – in the heart of Valencia. 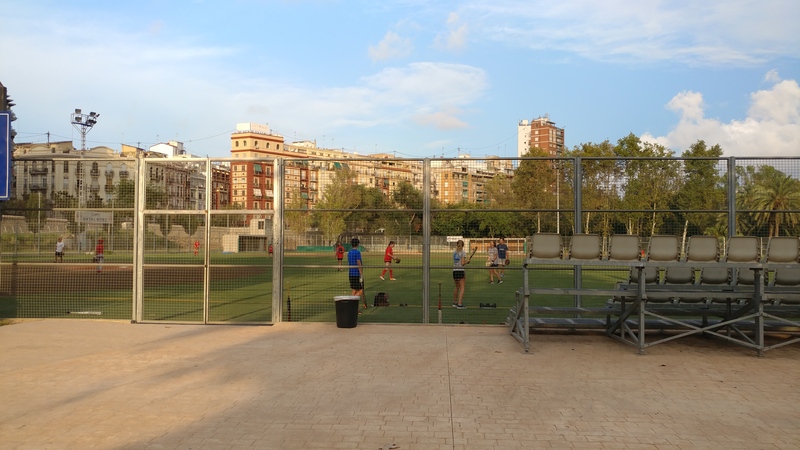 I found that Valencia has a host of outdoor activities and sports options in the Jardin del Turia – a public park that winds through the city. It is beautiful, easy to navigate and more than seven kilometers (about 5 miles) long. Each number on this fuzzy map represents a different section of the riverbed, divided only by bridges or walkovers. The park is naturally compartmentalized by way of these bridges which connect one side of the city to the other while also providing a natural segue from one type of activity to another. 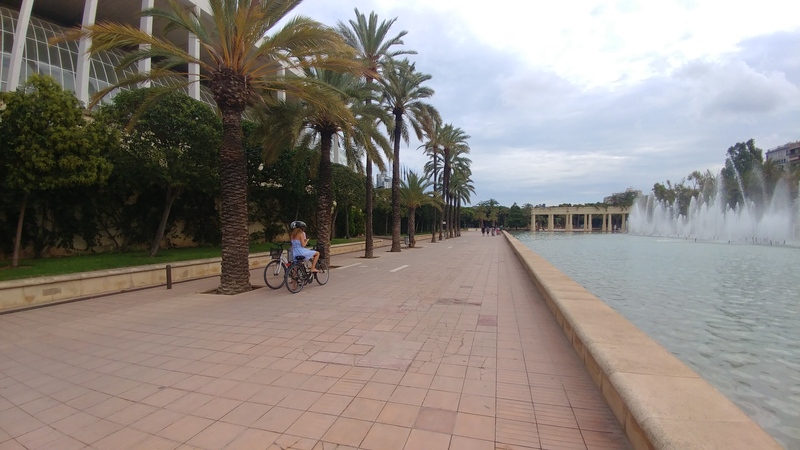 The Jardín del Turia was built out of a diverted riverbed in Valencia after a tragic flood occurred there in 1957. This urban, green space is a large contributor to the positive, sporty vibe of the city. Imagine an enormous, well-curated, beautifully landscaped and maintained park designed to enable a small city to come together as a community. The Turia begins with the Oceanográfic Aquarium and Marine Research Center on one end. From there, it winds around the city and includes an area for arts and sciences, an opera house, sculptures, art, and fields for many types of sport. 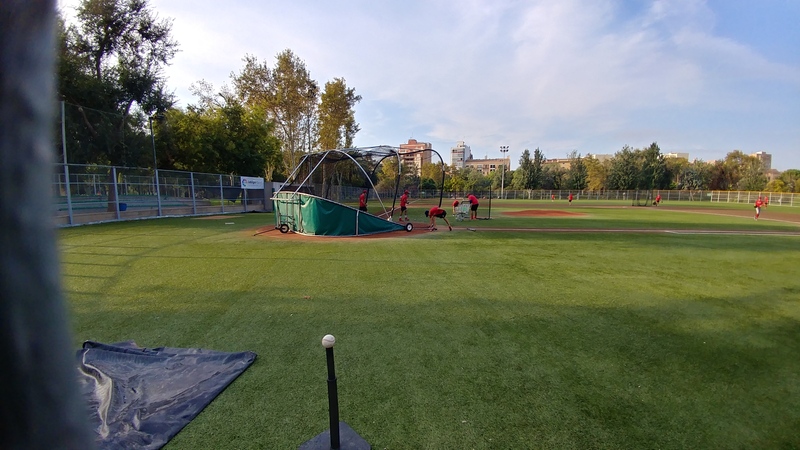 Rugby, baseball, and soccer have impressive artificial turf facilities. 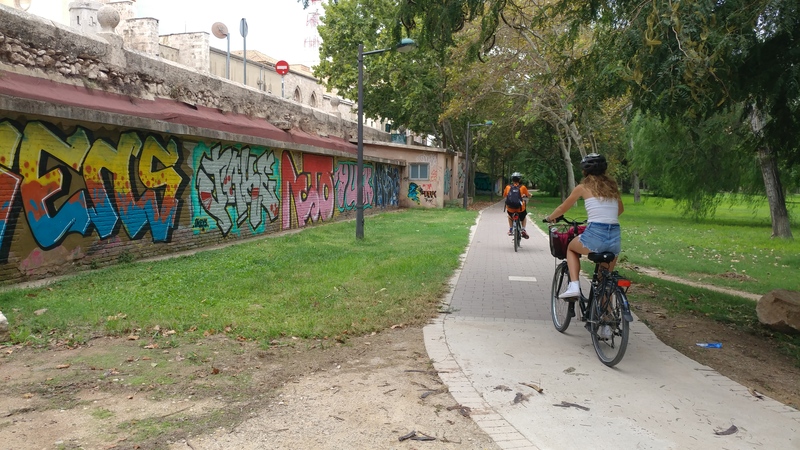 On a single day of bike-riding in the Turia, we saw groups of people enjoying dance, pilates, yoga, running, biking, fencing, martial arts, skating, walking, meditating and also multiple playgrounds for children. There is a zoo, biopark, giant play-sculpture and beautiful gardens. Did I mention there are cafés? 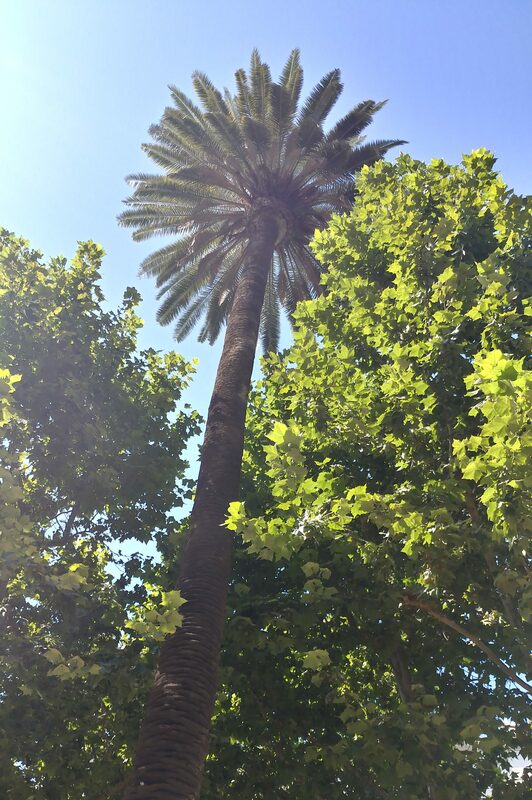 Valencia is crazy-beautiful with so many different areas saturated in complete contrast from the other: modern, historic, cultural, athletic, hip – dense city, beautiful parks… outdoor living is an important part of life here. For four weeks, Oliver and Sophia played softball and baseball for the Astros and Antorcha teams. As we had hoped, our kids made friends and improved their Spanish by total immersion in a sport they love. 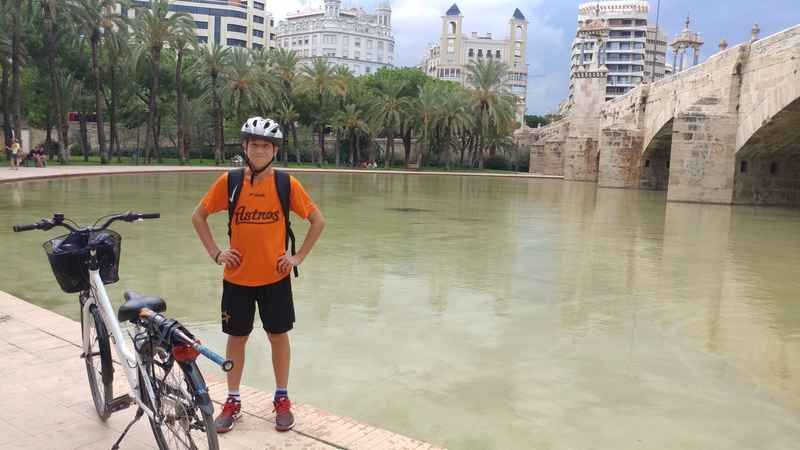 Oliver pausing near a bridge in the Turia, en route to one of his practices. Oliver practiced 6 days a week with the U15 Astros, the U18 Astros and the U15 Antorcha teams. 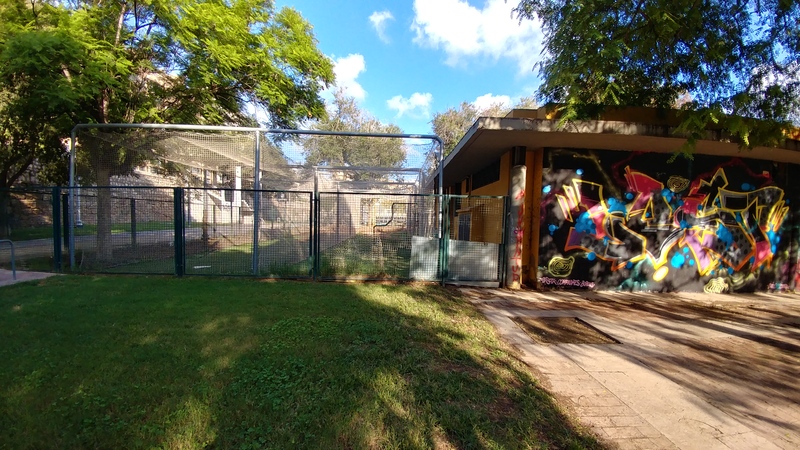 Batting cages and an artful, graffiti’d wall separate the baseball fields and cafe from the skate-park behind it. Next Post Land. Sea. Repeat. Always loving your posts, Lynne! Not blog, not travelogue. Just the right stories, just the right tone, just the right length. I think you’ve invented your own genre. Call it … Cortado. Sorry – Timbalero! Love this about baseball. We had a similar experience when our boys were young while sailing in Cuba. One of my original vignettes, and later incorporated into the book, talks about “baseball diplomacy” where they played baseball with village kids and quickly learned some Spanish on the fly. Crazy what incentive that is!